Karl Mattson’s sour gas escape pod, Rolla B.C. Pod at Sweetwater 905 Festival 2012. Karl Mattson, an artist and filmmaker from the town of Rolla in Northern B.C., produced this “escape pod” artwork last year. I saw it a few weeks ago on the concert grounds of the Sweetwater 905 Festival. 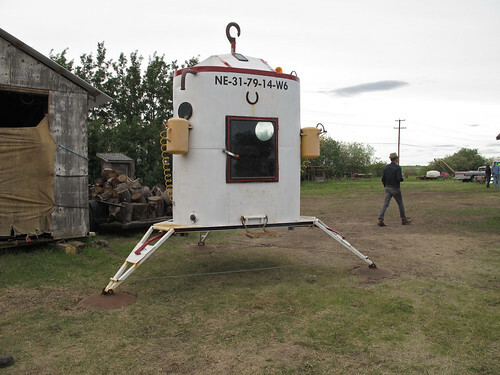 It may look like a space capsule playhouse for kids, and sometimes it is, but it was actually built as shelter from the very real danger of highly toxic sour gas leaks, as well as a protest against the inadequately regulated gas industry in Northern BC.